I have to give a shout out to the 3hive crew for turning me on to The Lovely Bad Things. Those guys have such great taste in music and I often visit the site when I have the need for new sounds in my ears. Thanks! La Mirada, California’s The Lovely Bad Things represent what I loved most about bands like the Pixies and Pretty Girls Make Graves. They've got this raucous highly intensive garage sound melded with sharp hooks and sweet harmonies that will have you instantly mouthing the words to the songs before you even know what the lyrics are. They also all sing and play each other’s instruments, as if being huge fans of the Pixies wasn't endearing enough. 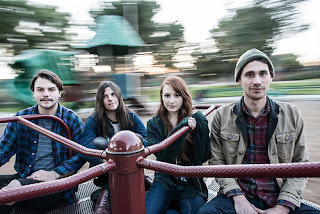 Made up of brothers Brayden and Cameron Ward, Tim Hatch and Lauren Curtius, and clearly evident by listening to their song lyrics, all pop culturalists and sci-fi geeks, The Lovely Bad Things hit the scene around 2010 with an unofficial first release title Shark Week. Two years later a bigger splash would be made with their quickly sold out Maxi-EP New Ghost/Old Waves on Burger Records. New Ghost/Old Waves has since been reissued on vinyl along with their official debut album The Late Great Whatever through Volcom Entertainment. 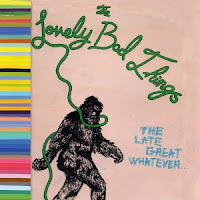 Preview the rest of The Late Great Whatever on The Lovely Bad Thing's Spotify page.